BlackZine is a 2 columns fixed width magazine style WordPress theme developed by MagPress.com. This black WordPress theme is built with an easy to use theme options, full page width featured content slider, magazine style content block with integrated timthumb auto thumbnailing feature, latest posts from categories, adsense ready, Youtube video embed, Twitter and many more. This BlackZine WordPress theme is licensed under a Creative Commons Attribution-Share Alike 3.0 United States License. Site is working really good with your theme. Have added plugins and no conflicts. All work well. One thing: Where can i go to change the default image that displays when a new post is created? Hai. I’m glad everything worked out for you. You can change the default image by going to functions.php and look for “Get Standard Post Image” change the post-default.jpg to your preferred image. Thanks. what does it cost to modify a theme? Hai. Please email us (webmaster@magpress.com) regarding this matter. Thanks. When approving a comment, the error below is posted without the comment. Is this something we should be able to fix in the comments.php or other file? Please installed the latest version of WordPress 3.1.2 and PHP 5+. 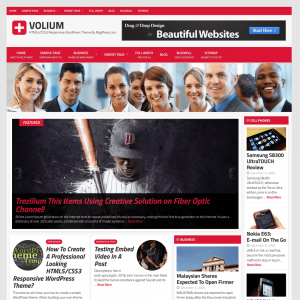 Great WordPress theme. Easy on the administrator. And displays super. Is there any way the “Related Articles From This Category” feature in the sidebar can be deleted? You got the best themes out there and your support is first class. Is there any way to change the colors of the buttons on the navigation bar, the title text in the featured slider and the submit comment button? Yes. All files are inside the css folder. Just wanted to give a big “THANKYOU” for the great work you have done in modifying my theme. It was a lot cheaper than I thought it would be.